This week, Armenians worldwide commemorated their great national tragedy, the Armenian genocide of 1915. Robert Kazandjian explains why the battle to have this episode recognised matters. Ottoman Gendarmes posing in front of executed Armenians, in Alep, Syria, in 1915. It is a fact that the Armenian Genocide and the ongoing fight for recognition underpin modern Armenian identity. Yesterday marked the 98th year since our great tragedy. From Ataturk to Erdogan, successive Turkish governments have followed a policy of fierce denial: the genocide never happened. And so, the catastrophic wound inflicted upon our collective consciousness cannot begin to heal. The blade of the Ottoman Gendarme’s bayonet remains buried between our shoulder blades. There will be no progress without recognition. 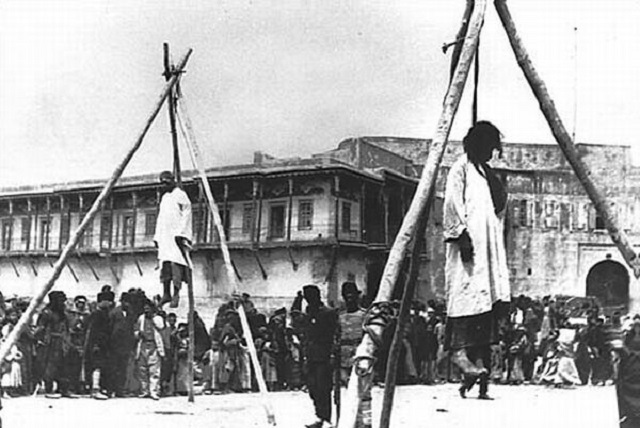 Under Ottoman rule, the idea of killing Armenians with impunity was cultivated towards the end of the nineteenth century. Under the dhimmi system, religious minorities within the Ottoman Empire were tolerated but not accorded equal rights. The Armenians, a Christian minority, populated the eastern provinces of Anatolia. When they called for reform in the 1890s, Sultan Abdul Hamid II formed the Hamidiye, a paramilitary unit made up of Kurdish irregular troops, to suppress the Armenians. Indiscriminate massacres took place, leaving 300,000 dead. Abdul Hamid II was removed from power by the Young Turk revolution of 1908. The nationalist wing of the movement consolidated power under the banner of the Committee of Union and Progress. Fuelled by a pan-Turkic ideology and under the cover of the First World War, the Armenian Genocide was planned and conducted. On April 24th, 1915, Ottoman authorities arrested prominent Armenian community figures and intellectuals in Constantinople and the majority were executed. This date conventionally marks the beginning of the genocide. Operating under the pretence that the Armenian minority was a security threat to the Ottoman Empire, wholesale deportation of all Armenians from the eastern provinces to concentration camps in the Syrian Desert was ordered. Deportation was code for massacre. Men, women and children were slaughtered. The barbaric methodology varied. Those who survived the death marches were left to starve in the camps. Over 1,000,000 lives perished. The end of the First World War signalled the dismemberment of the Ottoman territories by western imperial powers, desperate to divide and exploit the oil-wealth of what is now known as the Middle East. The Turkish Republic formed under Mustafa Kemal’s leadership. The Kemalists were totalistic nationalists and initiated the vehement denial of the Armenian genocide in order to create a monolithic Turkish state, refusing to acknowledge that Armenian provinces ever existed in Turkey. Kemalist propaganda depicted the Armenian minority as a rebellious, violent insurgency and attributed deaths to internal conflict. This has been the Turkish governmental line of argument since. Self-declared beacons of democracy, Israel, the United Kingdom and the United States, fail to officially recognise the Armenian Genocide. Of course, any move towards international recognition prompts a predictably angry response from Ankara. Turkey has long been of great strategic importance to the west: during the cold-war era, as NATO’s defender on the Soviet border, and today as a proxy in the Syrian conflict. It is a perverse irony that weapons entering Syria from Turkey are spilling the blood of Armenians directly descended from genocide survivors. In 2000, an Armenian Genocide resolution was proposed by congress to United States’ President Clinton. The resolution sought to ensure that recognition of the genocide became constitutional, a simple bill with no legal ramifications. Ankara warned the United States that passing the resolution would have disastrous consequences, Turkish airbases would be closed to American planes and weapons contracts would be cancelled. The resolution was quashed and a super-power had been censored by a client state. In 2012, French parliament submitted legislation that would make it a crime to deny any genocide officially recognised by the state. France only recognises the Jewish Holocaust and the Armenian Genocide, while failing to acknowledge her own atrocities in Algeria. President Sarkozy was seeking re-election and with the Armenian Diaspora in France being numerous, the genocide became a political football. Prime Minister Erdogan threatened retaliatory measures against Turkey’s NATO ally if the legislation passed. Any attempt to recognise the Armenian Genocide within Turkey is punishable by law and can have tragic consequences. Under Article 301 of the Turkish Penal Code it is illegal to insult Turkey, Turkish ethnicity and Turkish government institutions. Article 301 is an overt suppression of free speech. Prominent Turkish-Armenian intellectual Hrant Dink, who publicly acknowledged the Armenian Genocide, was charged under Article 301. Ultra-Nationalists with suspected links to the Turkish deep state subsequently assassinated him. These explosions of violence are inevitable. Governmental denial reshapes history and demonises the victims, successfully replicating the anti-Armenian sentiment that was rife when the genocide occurred. Immediate parallels can be made between the Armenian Genocide and the Jewish Holocaust. A World War created the ideal conditions for each atrocity to take place. The propagandist idea that Armenians were a disease that infected Turkish society foreshadowed the Nazi ideal that Germany needed to be free of the Jewish race in order to revitalise itself. When addressing his generals before the invasion of Poland in 1939, Hitler asked rhetorically ‘who, after all, speaks today of the annihilation of the Armenians?’ This statement is indicative of the successful erosion of memory perpetuated by Turkish governments. It is a fallacy to believe that the Armenian Genocide has two legitimate histories, one for the perpetrators and one for the victims. The genocide is not an allegation. It is a fact. The denial of the genocide is a cruel attempt to subvert the truth in order to preserve a national mythology. As an Armenian, I long for a Turkish leader to recognise the babies, tiny bodies injected with morphine, futures callously extinguished by doctors in hospitals. To recognise the children, forced onto crowded vessels, drowned in the Black Sea and the Tigris. To recognise the women, brutally, repeatedly violated and left to die. To recognise the men, horseshoes nailed to their feet, forced to walk the dusty road towards their own crucifixions. I long for a Turkish leader to confront history and allow the tortured souls of my ancestors to finally rest. Robert Kazandjian is a London-based freelance journalist and researcher. He has previously been published by The Independent and The Guardian, and writes on class, gender, race and international affairs. He's on Twitter at @RKazandjian. « Previous: Special Report | Lords Vote: Will peers vote to protect the NHS, or their pockets? Wow! Thanks to our diamond rich and so-called patriotic government in Armenia, we have been begging politics to make Turks accept the term ‘genocide’ and discussing our issues on Facebook, private blogs, Kim’s web page or at the news stands! We would have purchased at least ten judges on any international court of human rights with the money we have been trying to purchase politics for 100 years. This is an incredibly painful process for all Armenians and rapidly becoming like a joke because Jews had their recognition with a court order just after couple months after the holocaust but it has passed 100 years since 1915 and we still have no court order not even a rational attempt to solve the problem through an independent international legal procedure as it was supposed to be! The photos are not original. Syria has nothing to do with Armenian conflicts. I’m disappointed by the insulting. Events took place under monarchy and we fought with the responsibles. Stop saying Turks to capital monarchs. Notice that in 2013 ALL Ottoman Empire archieves are open to the researchers and any researcher can freely read ALL the archieves and documents in Turkey. However, Armenia still does not allow its archieves to be searched and reserached.